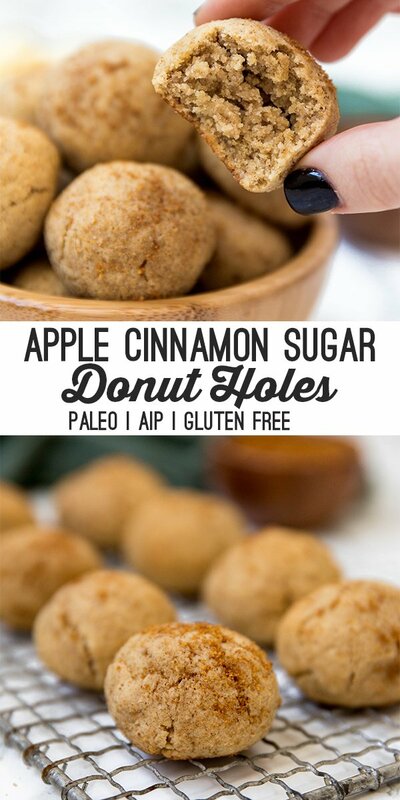 These paleo & AIP apple donut holes are a simple and delicious fall treat! They’re paleo, egg free, AIP, and are made in the oven. There’s nothing quite like a warm, cakey donut! Really though, who doesn’t like donuts? When I first went gluten-free, finding a good GF donut was one of my very first priorities. It was surprisingly easy to find a good GF donut, but it was much harder to find one that was egg free, grain free, potato starch free, refined sugar-free and canola oil free. That’s the kind of thing that you just have to make at home. But who wants to go through the trouble of frying donuts? This recipe is the perfect answer to all of those problems! 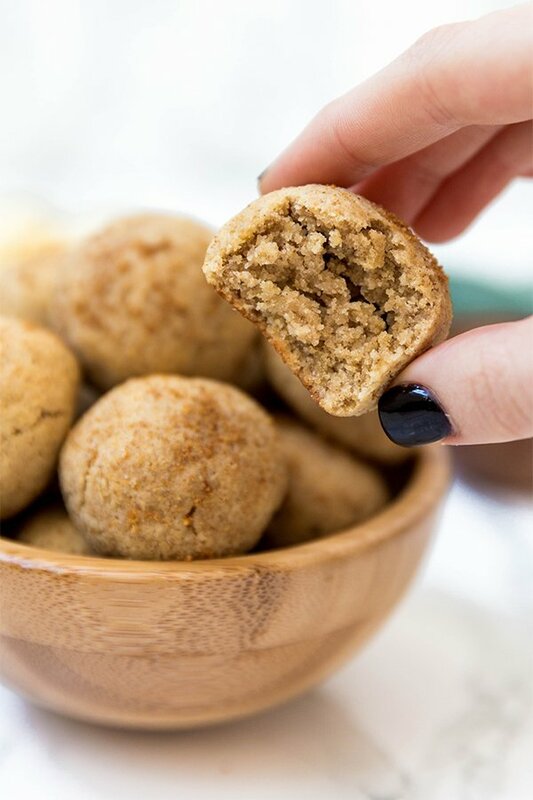 These apple donut holes are totally grain free, paleo, and AIP, and they’re not fried or made with yeast! They’re made using just one mixing bowl, and one pan in the oven… that’s it. It’s almost dangerous how easy and delicious these are. 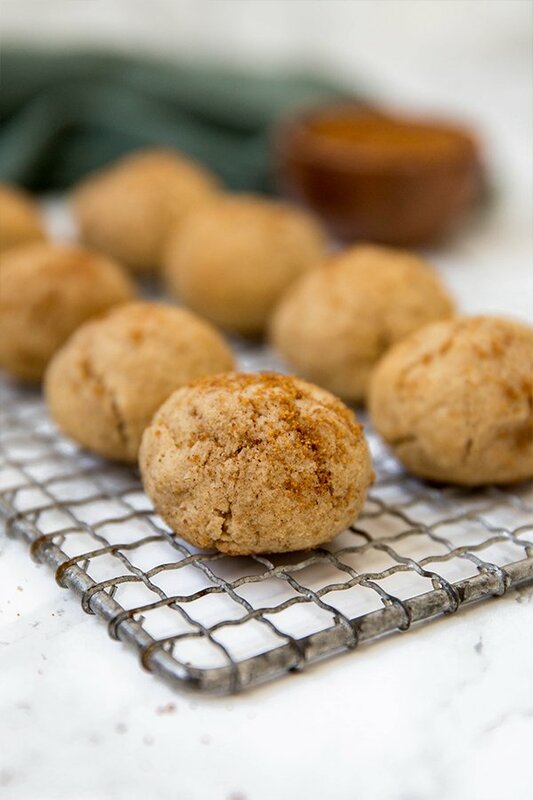 As long as you have the ingredients and 5 minutes to spare to mix them together, it’ll only take 15 minutes in the oven to have hot, fresh donut holes. That’s what’s up. This is the flour mix that I’ve found to work best for these AIP donut holes. The only substitute I think could work would be arrowroot starch in place of tapioca. Other than that, I don’t have any known substitutes for these flours. This adds the apple flavor as well as some added sweetness. Because of the applesauce, you don’t need as much sweetener in the base of these donut holes. This gives the donut holes the cakey texture that you see in the photos. I have not tried coconut oil in place of the shortening. I use vital proteins gelatin to help bind these donut holes further. 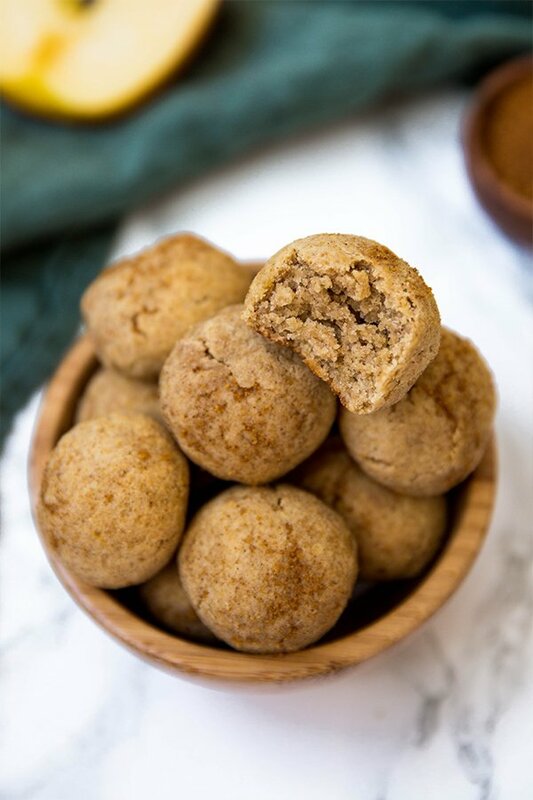 Roll the donut holes in a cinnamon sugar mixture for that signature donut flavor! Prepare the coating by combining the coconut sugar and cinnamon in a small bowl. Set aside. Combine the flours, gelatin, cinnamon, and baking soda in a large mixing bowl. Stir in the palm shortening, applesauce, and maple syrup. Roll the dough into donut holes (you’ll have 6-7) and place on the parchment paper. Bake for 15 minutes or until browned. While the donut holes are still warm, sprinkle them with the cinnamon sugar and carefully coat them. Serve and enjoy! Step 4 should read add shortening, applesauce, and maple syrup, correct? Was wondering the same Jamie. Recipe needs to be edited. These sound amazing. I’m new to AIP baking – is tapioca flour the same as tapioca starch? If they turned out too dry – do I need more palm shortening?